SAN FRANCISCO, California, November 9, 2010 (ENS) – The U.S. Environmental Protection Agency has turned down parts of California’s air quality plans to clear the air of fine particles that measure 2.5 microns, or PM2.5. These particles, 20 times smaller than the diameter of the finest human hair, can penetrate deep into the lungs and worsen asthma and heart disease. 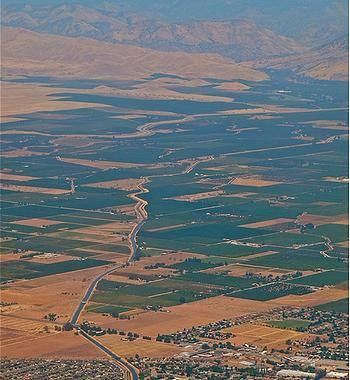 The plans that drew the agency’s disapproval fail to achieve adequate emissions reductions in the South Coast and San Joaquin Valley air basins. These areas have the highest annual levels of PM2.5 particles in the country. Primary sources contributing to PM2.5 and its precursors are diesel trucks, other diesel engines, wood burning, agricultural burning, and in the South Coast, ship engines. The EPA says reducing people’s exposure of particulate matter will decrease emergency room visits, hospital admissions, and premature death. In September, the state reported that more than 9,000 people die prematurely in California each year due to PM2.5 pollution. All states are required to submit plans to the EPA that identify how health-based air quality standards will be attained in areas not meeting federal air quality standards. The plans submitted by the California Air Resources Board, CARB, aim to bring these areas into attainment with the national health based standards for particulate matter by 2015. These State Implementation Plans, or SIPs, are the roadmaps to meeting the 1997 PM2.5 National Ambient Air Quality Standards set by the U.S. EPA to protect public health. The San Joaquin Valley and South Coast areas both violate the 1997 PM2.5 air quality standards. The EPA said Monday it cannot approve the plans since they rely on emissions reductions from rules including CARB’s In-Use Truck and Bus rule and Cleaner In-Use Off-Road Equipment rule that are currently being revised and have not been submitted to EPA. Without these rules, the plans’ attainment demonstrations are missing about a fifth of the emissions reductions needed for the areas to achieve the PM2.5 air quality standards. “California has a history of adopting aggressive rules to tackle some of the worst air quality in the nation, but we need to redouble our efforts,” said Jared Blumenfeld, regional administrator for EPA’s Pacific Southwest Region. “EPA will continue to work with California to strengthen measures to improve air quality for the millions of residents in the South Coast and San Joaquin Valley,” he said. EPA is proposing to sign off on those portions of the plans that have been submitted to EPA and approved. Some of the locally adopted and EPA-approved rules include residential wood-burning programs for both South Coast and San Joaquin Valley, and South Coast’s rules controlling emissions from some industrial processes. Blumenfeld said the EPA intends to make a final decision on the plans in 2011, after reviewing public comments. In the event the agency finalizes these proposed disapprovals and the state fails to correct the deficiencies in a timely manner, sanctions would apply. More stringent facility permitting requirements may be imposed after 18 months and highway funding restrictions may be imposed after 24 months from the date of final disapproval. Transportation projects scheduled for the first four years of the areas’ transportation plans would not be affected, and should be able to continue as planned. The majority of the emission reductions needed to demonstrate attainment of the PM2.5 standards have already been adopted by the California Air Resources Baord and the San Joaquin Valley and South Coast air pollution districts. Given the state’s commitment to public health, Blumenfeld said the EPA expects the state and local agencies will adopt creditable emissions reductions to meet the Clean Air Act requirements for PM2.5 standards.